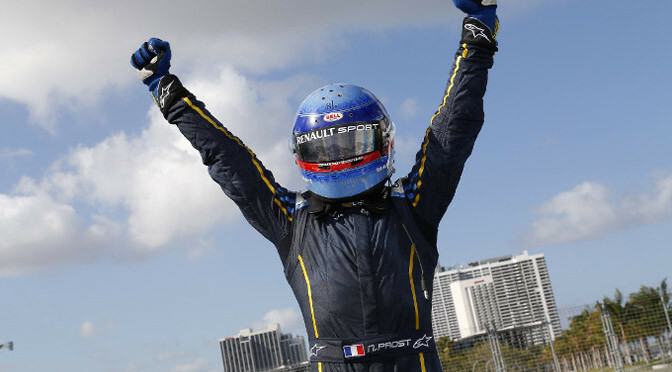 Nico Prost held off a late charge from Scott Speed to take victory in the Miami ePrix. It meant e.dams-Renault became the first team to score a second win, but five races in and we’re still waiting for a driver to do the same. Prost didn’t look like a potential winner during the first half of the race, as he was muscled out of second place by Virgin Racing’s Sam Bird. Bird chased down poleman Jean-Eric Vergne (Andretti) as the lead pair established a small margin over the chasing pack. The Brit pulled off a fine overtaking move to take the lead, but almost immediately had to slow to avoid over consuming his energy. The slow lap back to the pits dropped him to eighth place and out of the fight for the win. Vergne’s hopes were dashed by a long pitstop and then fading energy. With his pace compromised he slipped two laps behind and came home 18th – the last of the classified runners. As Vergne and Bird hit trouble, so Daniel Abt moved into the lead, just pipping Prost as the e.dams racer rejoined from the pits. With Lucas di Grassi close behind, the lead trio circulated in close company, but without ever threatening each other. The action was further back in the top-10, where Speed was in inspired form. 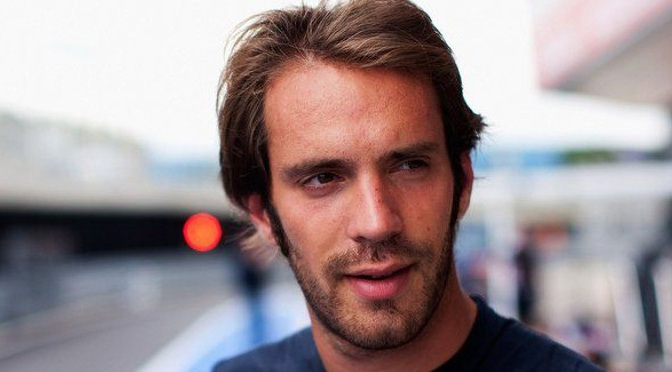 Having dispatched team-mate Vergne, he set about and passed Jerome D’Ambrosio (Dragon Racing) and then di Grassi in short order. Having pitted a lap earlier than his rivals, Abt was running low on energy, and with Speed looming large in his mirrors, Prost knew he couldn’t afford to get stuck behind the German. He took the lead with a superb lunge, but Speed also took advantage of the compromised Abt, and forced his way into second. The American had Prost in his sights, but there was just a lap left to go. With both drivers giving 100 per cent, it was an enthralling final lap, with Prost doing just enough to hold on for his first win and to take the championship lead in the process. Given he had to race in a plain white helmet such was the last-minute nature of the deal, Speed was understandably thrilled to have driven such a competitive race. 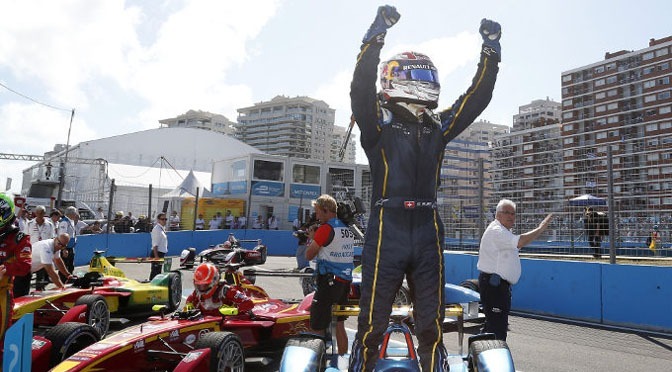 Sebastien Buemi clinched his first Formula E victory with a great drive in Punta del Este, holding off a charging Jean-Eric Vergne for a well-deserved win. Vergne started from pole, but lost out to the fast-starting Nelson Piquet Jr. But as the China Racing driver sought to press home his early advantage he pushed a bit too hard and brushed the wall. The damage was minor, but it meant that the handling of his car started to deteriorate. Vergne took the lead with a well-judged lunge into the Turn 8 hairpin and instantly pulled clear as Piquet battled with e.dams-Renault team-mates Buemi and Nico Prost, as well as an ill-handling car. When Venturi’s Stephane Sarrazin hit a kerb hard and broke his suspension and spun, the Qualcomm Safety Car came out. Its mid-race timing was perfect and all the drivers darted into the pits. This was especially well-timed for Mahindra’s Bruno Senna, who’d tagged the wall avoiding the spinning Sarrazin. He three-wheeled back to the pits, swapped cars and continued. The caution period came a lap after Vergne had pitted and he lost the lead to Buemi, who had finally found a way by Piquet, during the stops. For the rest of the race Buemi had Vergne in hot pursuit. But with four laps to go, the BMW i8 was deployed again, this time after Matthew Brabham slammed his Andretti entry into the wall of the exit of the fast T15 chicane. At the restart Vergne deployed his FanBoost, and although he closed right in, it wasn’t quite enough to make a pass. It seemed set for an epic final lap battle, only for Vergne to be denied by broken suspension. It was a cruel end to a great debut. With Piquet too far back to attack, Buemi could relax and score an impressive win. 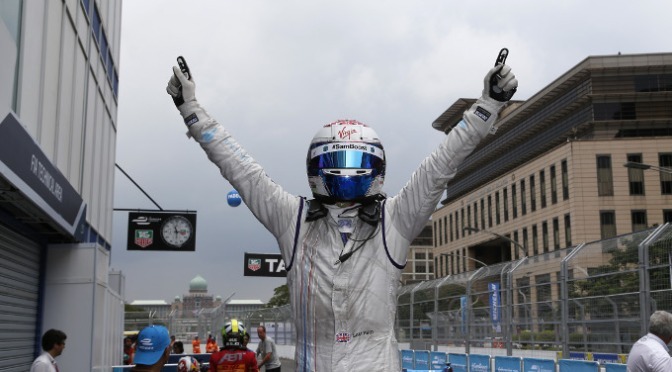 After being denied in Malaysia, Piquet was naturally thrilled to score his first podium finish. For the third time in three races Lucas di Grassi scored a podium finish, extending his championship lead to 18 points in the process. Virgin Racing’s Sam Bird remains in second, level on points with Buemi, but it was a race to forget for the Putrajaya winner. He crashed out early on at T2, causing the first of the three Qualcomm safety car periods. Jarno Trulli scored his first Formula E points after a feisty drive to fourth. The Italian enjoyed race-long battles with the likes of Brabham and Sarrazin. Jaime Alguersuari was fifth for Virgin Racing, Senna took sixth, Prost seventh after being penalised for using too much power. Dragon Racing team-mate Jerome d’Ambrosio and Oriol Servia took eighth and ninth, while Nick Heidfeld finally scored his first point in 10th. The Venturi driver actually came out in the lead during the pitstop, but was penalised for exceeding the minimum time. He was punished again for using too much power, but on the last lap his used his FanBoost to overtake Antonio Garcia and score a point. Daniel Abt picked up two bonus points for the fastest lap, but it was not a happy race for the German. His Audi Sport Abt car kept switching itself off, which meant he finally finished 15th, three laps down. The Andretti Formula E Team have today announced that Frenchman Jean-Éric Vergne is to drive for the squad at the FIA Formula E Championship Punta del Este ePrix. The 24-year-old has three seasons of Formula One experience and has participated in seven championships throughout his career, recording 40 victories and 68 podiums. The 2010 British Formula 3 Champion will join fellow countryman Franck Montagny to complete the Andretti Formula E two-car line-up for the American team led by Michael Andretti. The Punta del Este ePrix will mark the Formula E debut for Vergne, who competed full-time on the Formula 1 circuit with Scuderia Toro Rosso where he ranked 13th in the 2014 F1 Drivers’ standings. 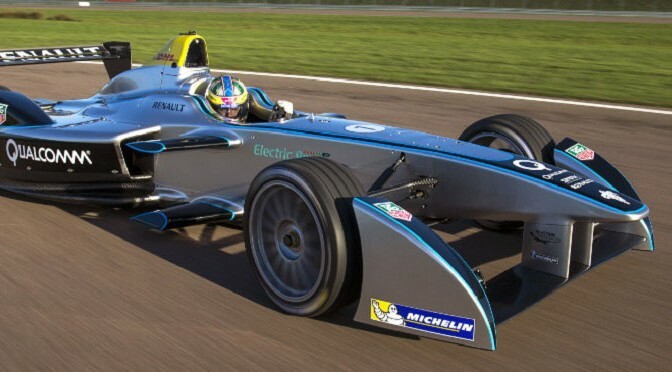 The previous two rounds in the inaugural all-electric racing series saw the team’s full-season championship driver Montagny, as well as Charles Pic and reserve driver Matthew Brabham in competition for Andretti. Sam Bird cruised to victory at the second race of the Formula E season in Putrajaya ahead of championship leader Lucas di Grassi and Sebastien Buemi. The Virgin Racing driver crossed the line to pick up the full 25 points and clinch his maiden ePrix win.